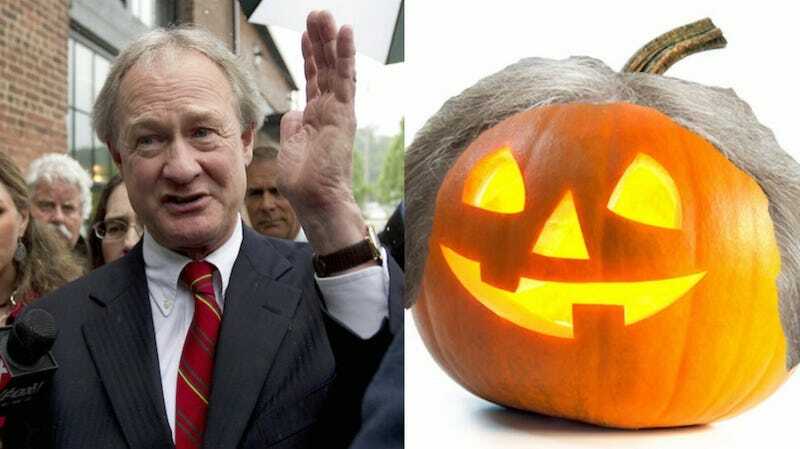 What Would Happen If We Put Lincoln Chafee's Hair On Different Autumnal Objects? Would it make you like him more or less? Former Rhode Island governor Lincoln Chafee stole our hearts during Tuesday evening’s Democratic debate as a wholly unelectable, charmingly unprepared bird of a man. He had a number of rough moments over the course of the evening (and not much else), like when he justified his Glass-Steagall vote with the info that he didn’t really know how to be a senator at the time, or when he condemned Hillary Clinton for her private email server and she flat-out ignored him and people applauded and laughed. I think if you, like me, love Chafee as a man and an ostrich (but not as a politician, God no), you’re probably feeling a little down today. But you know what I bet could turn your frown into a sweet, small, moist smile? Pictures of autumnal objects and scenes with Chafee’s signature center-part. A spooky Jack-O-Lantern rendered soft. One of these would really hit the spot. Gronk, an American icon, somehow better. Love to leaf peep when the time is right. Feeling better yet? I am :). Images via AP and Shutterstock.